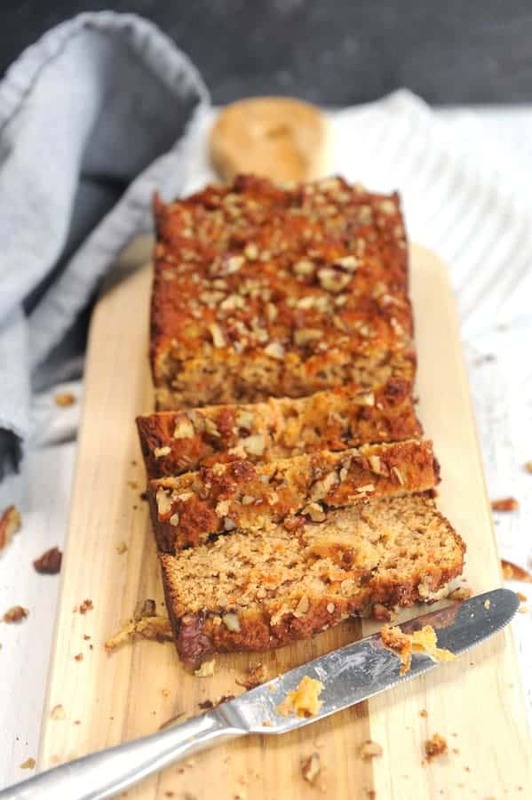 If you’re looking for a carrot cake healthy recipe to feed your brunch guests this Easter, this carrot cake breakfast bread is the perfect choice! 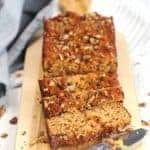 With no refined sugar this gluten free carrot cake will be a delicious and healthy version of a seasonal family favorite! It’s almost Easter time! I don’t know about you, but carrot cake is one of my favorite spring desserts! 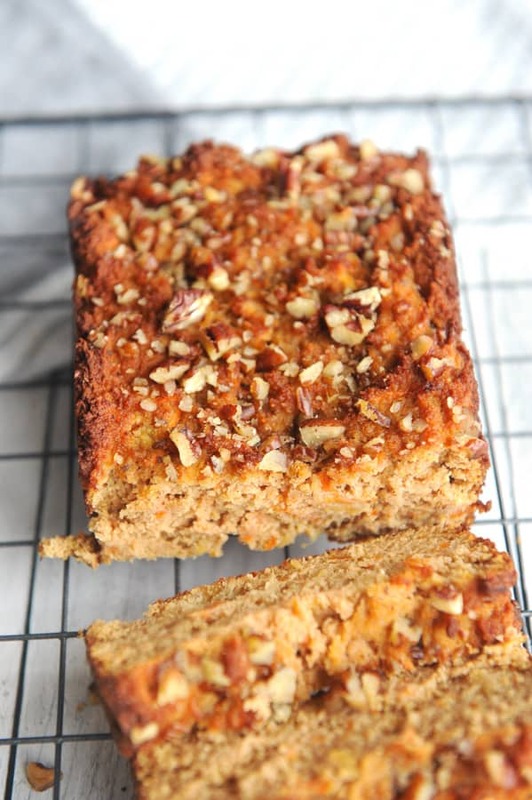 I love the flavors so much I decided to put a healthy, breakfast-y spin and create carrot cake breakfast bread! My Favorite Tools for Healthy Baking! These are a few of my favorite must-have tools for healthy baking! Does an Air Fryer really make a difference? Check out my thoughts and my Top 10 Meal Prep Must-Haves! 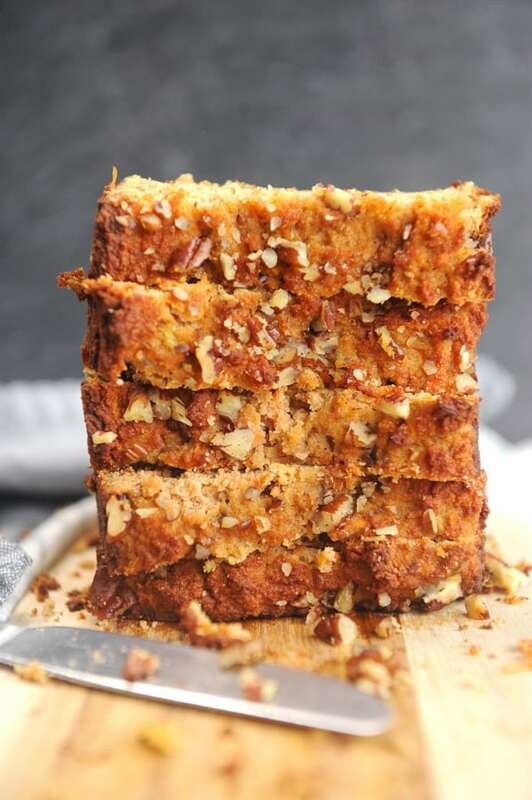 This carrot cake is gluten free and made with coconut flour! When cooking with almond flour you have to be aware of your ratios! Generally coconut flour is a 1:4 ratio. Meaning that 1 cup of all purpose flour equals approximately 1/4 cup of coconut flour. This is very important when moisture is involved! 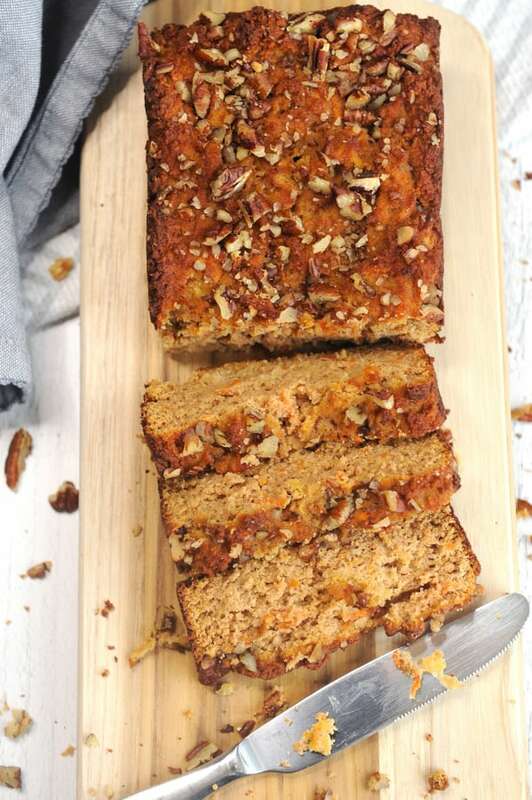 The secret weapon to make this carrot cake healthy recipe delicious and moist is pineapple! Pineapple gives a natural sweetness that helps to keep the recipe free of refined sugar. But it also adds an added level of moisture! If you have to add in a bit more coconut flour, no big deal! I actually tested this recipe twice and added in more coconut flour since my first batch was a bust! Easter coincides with spring which sometimes means lighter meals! If you are looking to serve a lightened up Easter brunch, here are a few ideas for a healthy Easter brunch! Decorated for Easter yet? Check out how I’ve decorated my home for the Easter holiday! 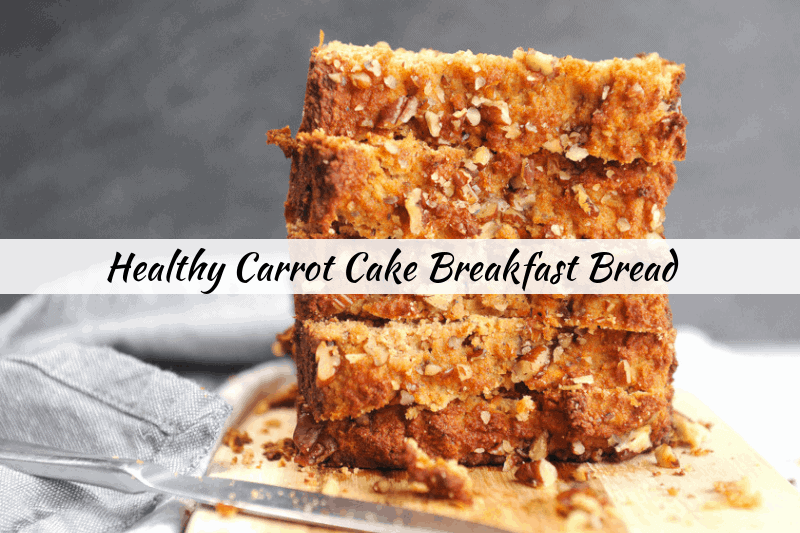 If you're looking for a carrot cake healthy recipe to feed your brunch guests this Easter, this carrot cake breakfast bread is the perfect choice! 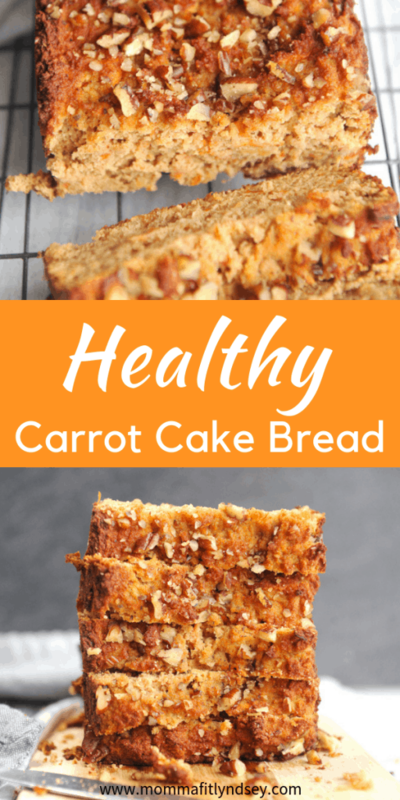 With no refined sugar this gluten free carrot cake will be a delicious and healthy version of a seasonal family favorite! Preheat oven to 350 degrees. Prepared a bread pan by spraying with coconut oil. Measure out dry ingredients and mix together. I like to sift my ingredients but it's not essential. Set aside. Cream sugar and butter until combined. Add eggs one at a time until combined. Add vanilla and greek yogurt. Fold in shredded carrots and drained, crushed pineapple. Mix until incorporated. Add dry ingredients to wet and stir until combined. Do not overstir. Add to prepared bread pan and top with toasted pecans. Bake in oven for 40-50 minutes or until a toothpick inserted in the middle comes out clean. Cool in pan for at least 10 minutes and then transfer to a cooling rack for further cooling. Note: To make recipe vegan friendly, use coconut yogurt. Have you started planning your Easter menu yet? Tell me about what you are making in the comments!